Citation: C N Trueman "America and Rocket Technology"
America also put a great deal of effort into rocket research. By the spring of 1945, the US Navy alone had 1,200 factories that worked on rocket production. However, America’s acquisition of Wernher von Braun and his input into America’s post-war rocket development, has tended to overshadow the work done by America during the war. Probably the most successful rocket developed by the Americans was the bazooka. Development on the bazooka started in December 1940. The scientists brief was to develop a weapon that could take out a tank but that did not have the inherent problems that bedevilled any weapon that fired an armour-piercing shell – high recoil. The missile fired by the bazooka developed its speed during the flight – not when it was fired. Therefore it was far easier for an infantry soldier to use this in combat rather than a weapon that had potentially damaging recoil. The missile fired by a bazooka weighed 3½lbs, was 21 inches in length and fired from a 7-inch tube. In war the bazooka was a formidable weapon. It could destroy a tank at 200 metres and a stationary target, such as a machine gun post, could be destroyed from 750 metres. Larger versions were developed for planes. 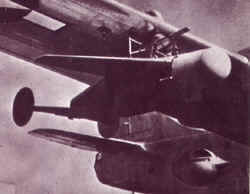 As the war progressed, the 20-tube ‘whizz-bang’ and the 24-tube ‘grand slam’ were used by planes. In the Far East, a 120-tube rocket launcher, the ‘Woofus’, was fitted to landed craft. The rockets that were fired were slow (125 mph and had a range of just 200 metres) but they were highly effective. They were used to bombard a beach as the landing craft approached, thus giving the soldiers who were landing more protection against Japanese defenders. An interesting American rocket development involved rocket attacks on submarines. It was far too easy for an attacking plane to overshoot its intended target – a submarine – so that its bombs failed to hit the target. The US Navy used a retrorocket on its bombs to slow down the speed of descent of its bombs thus making them far more accurate and deadly. The last submarine to be sunk in World War Two was on April 30th,1945, in the Bay of Biscay – by one of these bombs. The Americans also developed the ‘Bat’, pictured above, which was a long range guided missile that was nearly 12 feet in length and capable of 3,000 mph. It had a range of 20 miles. However, it came into production too late in the war to have any major impact.